I awoke at 4:33am, could not fall back to sleep, so got up and started the day with coffee and the world wide web. It wasn’t long before the sky turned blue and the sun began to shine. Glory be! Could it be? This particular Anchorage summer has been seriously lacking in the sunshine department, so it was an unusual, but certainly welcome sight. After awhile, I donned my jacket since it was a brisk 48 degrees outside and set about finishing getting myself, the dogs, Dora, and Lil’ Pea ready for day one departure. Devin and Pearl very thoughtfully came by to wish me well and wave goodbye. 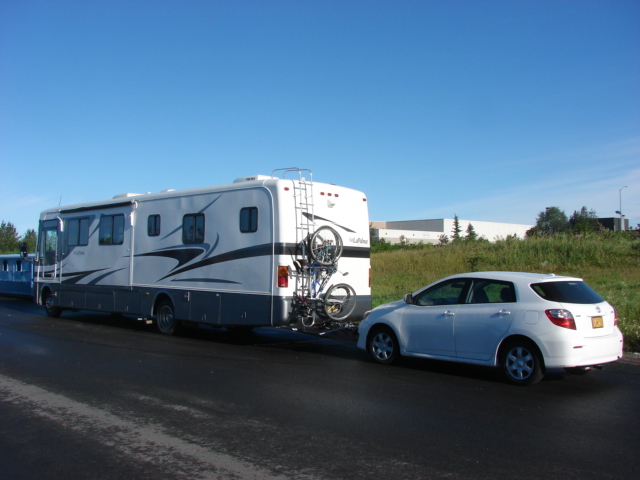 I stopped for propane and the dumping of tanks and was on the road by 10am. I am happy to report that, although it was a long day, all went off without a hitch. Along the way, we stopped at the Matanuska Glacier for a quick hike and some lunch, again in Glennallen for gas, once more somewhere along the Tanana River Valley to stretch the back and legs, and finally arrived at the Tok River State Recreation Site at 6:30pm. Yes, you counted correctly. 8.5 hours. 322 miles. Whew, it was a long day and I think the major contributing factor was the road conditions. They were narrow little two lane affairs without a shoulder or guardrail in sight wandering up and down hills and mountains and around sharp corners for a number of miles around the Glacier and then once we turned onto the Tok Cutoff Road, well they just gave up and went to Hell in a handbasket altogether. I felt like I was on some sort of amusement park ride for roughly 200 miles and just in case any of us drivers didn’t notice our fillings bouncing out of our teeth, every now and then the State DOT had placed large orange signs helpfully explaining, “ Road Damage”. I’m told I have roughly another 200 miles of damaged roads to look forward to, so tomorrow may well be another go at Mr. Toad’s Wild Ride. Here we are. All 28,000 lbs and 56.5 feet of us. This is Mosely’s first “driving position”. He sits here until he gets bored and moves over to the sofa with Misty. They are only allowed on the sofa when we are in motion, by the way. 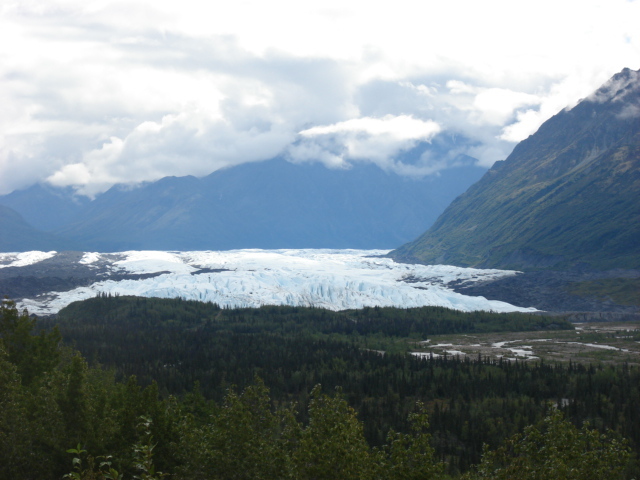 The Matanuska Glacier, former ice climbing stompin’ grounds of mine. 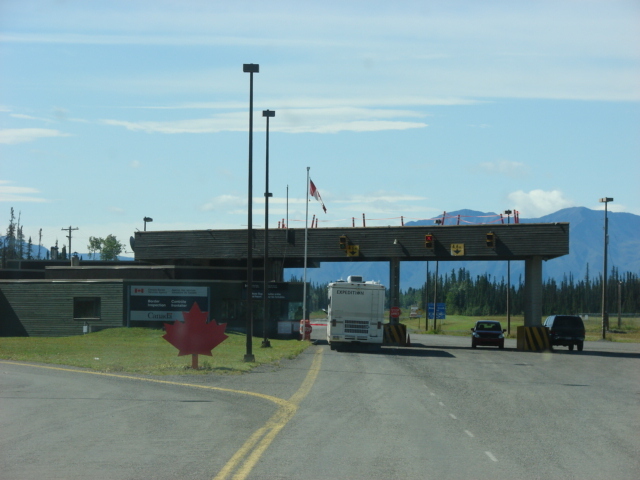 The Canadian/Alaska Border on The Alaska Highway. 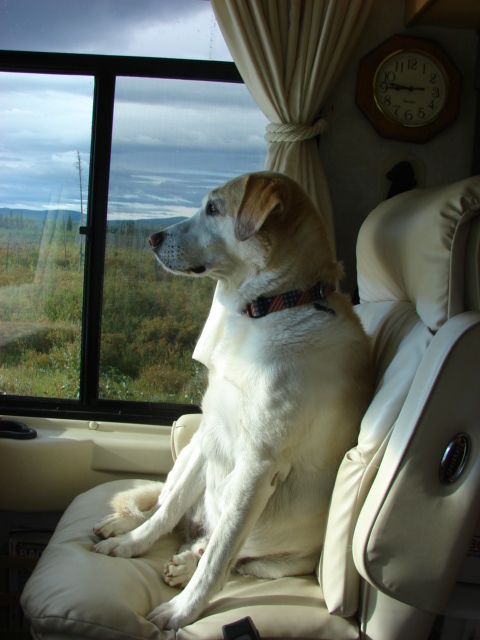 Marge…I’m jealous…would love to be going on the big journey…beautiful country….great weather…ideal companions…love the pic of Mosley the ‘co-pilot’. Looking foward to the trip updates and ‘detail discription of’ everything’! And an awfully cute co-pilot at that! I’m glad everything is going smoothly for you so far (road conditions excepted)!